If you can relax your body, your mind will follow. Whether you’re experiencing a full panic attack or mild anxiety, you can’t always will yourself into a state of calm. You might already be using calming methods focused on the mind, such as identifying why you feel anxious, reasoning with yourself, or challenging your negative thought patterns. These techniques often work well, but other times you might continue to feel anxious despite your best efforts. What can you do when mind-based methods don’t work? Try using calming methods focused on your body. Anxiety is present in the physical body just as much as it is in the mind. The mind–body connection is strong. If you’re anxious in your mind, you’ll also be anxious in your body and vice versa. For example, a stressful business meeting can cause anxiety-provoking thoughts in addition to muscle tension, shallow breathing, and elevated body temperature. If you cannot calm your anxiety using mental methods, you might have more success with body methods. 1) Sitting or lying down with your arms at your sides, ball up your fists and squeeze tightly. You want to squeeze hard enough that you shake slightly (consult your medical doctor first if you have any concerns). Hold your squeeze for a count of 10, then release. 2) Let your arms lay motionless at your sides for 20 seconds. 3) Repeat as needed until you feel that your arms are relaxed. Some people choose to focus on all of the muscle groups in the body one by one, and some only focus on the areas where they store the most anxiety. Muscle groups you can focus on are the feet, calves, thighs, core, lower and upper back, arms, neck, and face. Some of my clients have used muscle relaxation to help them to get to sleep. They lay in bed and focus on tightening and relaxing certain groups of muscles until they fall asleep. You can also use this method if you wake up in the night and cannot get back to sleep. Diaphragmatic Deep Breathing. This technique allows lots of oxygen to quickly enter your body, which can result in a calming sensation. While sitting or standing breathe with your diaphragm. A simple way to achieve this is to imagine that you are breathing from your stomach rather than your lungs. When you breathe in, your stomach should rise or expand, and it will fall or contract as you breathe out. Use this method while taking deep breaths. Some of my clients have found that using muscle relaxation and diaphragmatic deep breathing together increases their ability to calm themselves. It’s important to learn and use a variety of calming techniques focused on both the mind and the body in order to successfully calm anxiety. 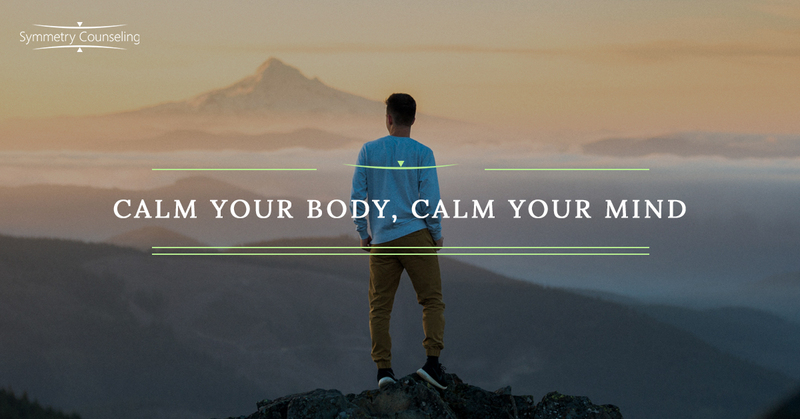 For more information about mind and body calming techniques, contact Symmetry Counseling today.